The Facial Analysis Diet was created by celebrity nutritionist Elizabeth Gibaud. The foreword to the book is written by Kate Winslet who lost more than fifty pounds that she gained during pregnancy by following this program. In this book Gibaud reveals the secrets of facial analysis, a system that is based on German theories related to principles of biochemistry. By examining the tone, texture and shape of the face it is possible to diagnose the condition of the internal organs of the body. Additionally changes in color and the appearance of markings, lines and wrinkles are all factors that can signify an imbalance of certain essential minerals. The first section of the book explains the principles of the diet and outlines the role of twelve minerals that are important for the body. In the next section you will use a self-evaluation method to determine your unique facial type. Once you know your ‘type’ you are then given a list of foods to eat and foods to avoid. Gibaud claims that knowing the foods that you should avoid will help you increase your energy levels and enable more effective weight loss. Certain facial signs are described and their implications on your health are explained. For example, if you have open pores this could mean that you have too much acid in your system. Red or puffy cheeks may be the sign of intolerance to dairy products. The Facial Analysis Diet commences with a two-day detox that is specific for your facial type. This is followed by a two-week core diet that is the same for all of the types. Dieters are instructed to avoid refined carbohydrates while always selecting the whole grain versions of bread, pasta and rice. All dieters are advised to avoid caffeine during the diet because it causes fluid retention, headaches, insomnia and anxiety. Alcohol should also be avoided because it causes dehydration. Whole wheat bread, whole grain pasta, brown rice, potatoes, oats, unsalted butter, salad, steamed vegetables, fresh fruit. The Facial Analysis Diet does not involve exercise, however, apparently Kate Winslet walked every day that she was following this weight loss plan. 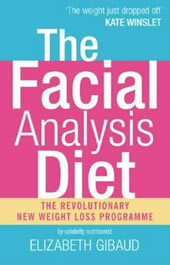 The Facial Analysis Diet retails at $23.95. Diet is customized according to individual indications. Encourages the intake of whole grains, fresh fruit and vegetables. Most dieters should lose weight on this plan. Meal plans are very low in calories; especially during the two-day detox diet. Diet plan is boring and meals are very bland. Many foods must be eliminated for all types including chocolate, dairy and meat. Some of the recommended foods may be difficult to find. Claims in the book are not supported by scientific research. Supplements are required if organic produce is not available. Dieters may experience uncomfortable symptoms such as headache and fatigue when eliminating caffeine. Does not include vegetarian options. While The Facial Analysis Diet is marketed as a customized plan this is actually quite misleading. The diet plan for your specific facial type is only followed for the first two days of the program and after this all types adhere to the same diet. Dieters are likely to lose weight on The Facial Analysis Diet, but this is due to the reduction of calories and the elimination of salt, sugar, dairy and processed foods, rather than any special effects of including or avoiding foods in accordance with facial types. I did this diet for 2 months in 2001. I lost 30lbs or just over 2 stone. The first few days were really hard and I felt quite headachy, tired, and hungry. After that, I felt great and I didn’t have many cravings. I did find that I had to snack on some veggies between the afternoon cup of tea and dinner. I saw Elizabeth personally and would recommend this diet to anyone who is disciplined enough to take their own food with them while on the diet!